The Secrets of Darcy and Elizabeth is my favourite book from Victoria Kincaid and one of the reasons why I loved it so much was the setting. In it, she takes our dear couple into an adventure in France, so when I heard that The Unforgettable Mr. Darcy would also take place in Napoleon’s country I was very excited. I don’t want to tell you much about the premise because I believe that not knowing increases the pleasure of reading the first chapters, but I can tell you that the shock of what will happen associated to an incredible writing, will make you stop breathing for a while and then cry as you share Mr. Darcy’s pain. 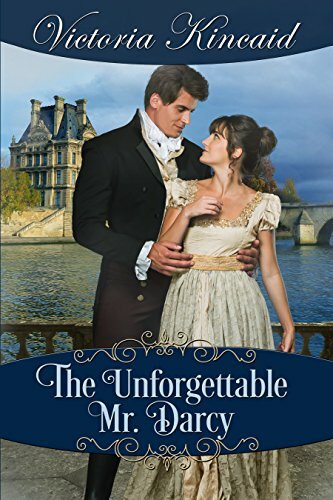 As all of Victoria Kincaid’s books, The Unforgettable Mr. Darcy is a true page turner that is easily read and enjoy, it has an adventurous but also very romantic plot that will grab your attention from he first page until the last. This is a particularly difficult review for me to write because by not mentioning the storyline, I’m unable to give you many details as to why I loved the book, but I can assure you that the main characters are as lovable as all of Ms. Kincaid’s characters, particularly Mr. Darcy who is a true romantic hero. I loved the way Ms. Kincaid made him suffer, but also the happy moments she presented him with. His character is romantic and passionate and I loved that! Towards the end of the book we see him pronounce the most endearing words possible and again my heart ached for him. His speech and attitude towards the lady who will not have him is so moving and touching that I could not stop reading until he found his happiness. Some of the secondary characters also add to the story, namely someone from Darcy’s past who will make us see a different side of him. The storyline advances very fast so there isn’t one single boring moment in the entire book, and even if sometimes the plot seemed to be a bit rushed, I enjoyed the pace of the novel. Victoria Kincaid would like to offer to one of my readers a copy of The Unforgettable Mr. Darcy in either ebook format or paperback (winner’s choice), and an audiobook of The Secrets of Darcy and Elizabeth, this way two of my readers may travel to France through her beautiful descriptions of the scenery. The giveaway is international and it is open until the 13th of September. To enter it please comment on this post and let us know what you think of this excerpt, or Ms Kincaid’s work. I read and loved this book. I plan to read it again! Hi Sheila, I’m so glad you enjoyed it! Thanks for sharing. I have been intrigued by this book since first reading about it. Would love to win it. Thanks for the opportunity. Hi Maria, Thanks for your interest and good luck! I’m so pleased to read this review Rita. I have this book on my to buy list as I do enjoy Victoria’s books. I love your description of Darcy (it seems I must have my tissues at the ready) Thank you. Hi Glynis, Thank you for being a faithful reader. I hope you enjoy the book! Hi Vesper, Thanks for your interest and good luck with the giveaway! This sounds lovely. You have whet my appetite for more. Hi Mary, I’m so glad you’re intrigued! Good luck with the giveaway. Wow. A very interesting excerpt–I’d love to read more! Thanks for the giveaway! Hi Lynda, I’m so happy you’re intrigued. Good luck with the giveaway! Hi Denise, Thanks for your interest and good luck with the giveaway! Love the excerpt and i am looking forward to reading this new book. Thanks Rita for hosting and thanks to our author for the generous giveaway. Blessings Victoria on the success of this work. Good luck to everyone in the drawing. Hi JW, Thank you for your kind comments! Good luck with the giveaway! I am listening to The Secrets of Darcy and Elizabeth right now and am greatly enjoying it. I haven’t read too many books where the action takes place in another country and am greatly enjoying the change of scenery. The Unforgettable Mr Darcy sounds like a wonderful book as well and is already on my wishlist. Thanks for the chance to win a copy. I’m so glad you’re enjoying the Secrets audiobook! Good luck with this giveaway! Hi Charlotte, I’m happy you found the excerpt intriguing! Good luck with the giveaway. Oh, there are a number of heart-wrenching moments in this book! One has already come and gone and this is the next. I love that Victoria has gone to France with this book, as she did with her first. I’m surprised it doesn’t happen more often in Austenesque fiction – plenty of scope for danger, angst and, above all, page time for the two of them together. The audio version of The Secrets of Darcy and Elizabeth is wonderful. Stevie Zimmerman has a real feel for this kind of fiction. I’ve not come across anything other than a brilliant performance from her. Of course, what she’s performing is pretty amazing, too! Please don’t put my name in your giveaway hat, Rita. As you can see, there’s no need! Hi Anji, Thank you for your heartfelt endorsements of both books! Yes, although it is a bumpy road for both of them. Good luck with the giveaway! Thank you for that lovely review! I’m so glad you enjoyed the book. I think it’s an original point of view to set the story in France. It’s allways a releive to know there allways is a happy ending. Hi Heleen, I’m so happy you find it intriguing! Good luck with the giveaway. What a powerful excerpt! The process of recognition was so very well described. Thank you for the review and the giveaway! Hi Agnes, Thank you! I’m glad you liked the excerpt. Good luck with the giveaway! Hi Claire, Thank you for being a faithful reader and good luck with the giveaway! The excerpt grabs you immediately and pulls you in to the story. I can’t wait to turn the page. I read everything by Victoria Kincaid! I’m so looking forward to reading this book. Thanks for featuring Victoria! Totally intriguing excerpt. Looking forward to reading more! I was just introduced to your work… and I think I will read them all! I love the idea of Darcy as a spy! Thank you for the review and for the opportunity to take part in the giveaway! If I may ask the author a question it would be: “Why your stories are set in France? Do you have a special relationship with that country?”. I would like to ear “The secrets of Darcy and Elizabeth” because I like the plot and to improve my English too! Thank you for sharing this Rita and for your review. The excerpt was great, so intriguing and mysterious. I’m curious to know what the relationship between Darcy and Elizabeth is at this point. How has she come to be in that situation? I’d love to win an ebook copy. Count me in to the giveaway! That was a non-spoilery review you have written, Rita. But considering the blurb already has the spoiler, I should like that you can elaborate a bit more of the plot. Anyway I would definitely enjoy any story featuring Elizabeth and Darcy in it.